Something I've gotten used to doing on my mobile when web pages act weird is to check the "request desktop version" button and guess what? The page loaded fine but I was left with more animosity towards iCloud and Apple for blatantly breaking an experience that should "just work". Your customers aren't just the people who bought your products. Provide "correct" details when things aren't going to work. Most businesses view their customers as the who buy their products or use their services. But in a day and age where social media has become a primary mechanism for sharing information your customer base is now extended to those that your customers share their content with. When you're building a product that allows users to share information via a URL you are essentially making a contract with that user that their content will be accessible by those they share it with on a modern web browser. In the iCloud case I'm baffled at why Apple would explicitly block Android users. I understand they're trying to get people to use their ecosystem, but they also need to face the reality that people in their ecosystem interact with people on the outside. How do I know they're explicitly blocking Android users? I took a look at the difference between the request headers that Firefox sends normally on Android and what it sends when you check the "request desktop site". The big difference was in Firefox's user agent string. While I don't think this is the case for iCloud, there may be completely valid reasons they're blocking Android mobile user specifically. For instance they may not have the resources, bandwidth, or experience to test their site fully on enough variations of the Android platform to support the experience. Even if that was the case, which I do not think it is, they need to be more explicit with their users and those trying to use the site that there are known and likely use cases where the experience is not going to be available. This leads me to the next thing we can learn from this experience. The web is often looked at as an "easier" way to provide a unified experience with broader reach than providing a native experience on multiple platforms. But with that broad reach and unified experience comes more responsibility to provide that reach. The above screenshot says that my browser isn't supported. That's not true, they don't support my operating system. I tried to open that link in Chrome for Android and the normal Android browser and all three of them had the same experience. 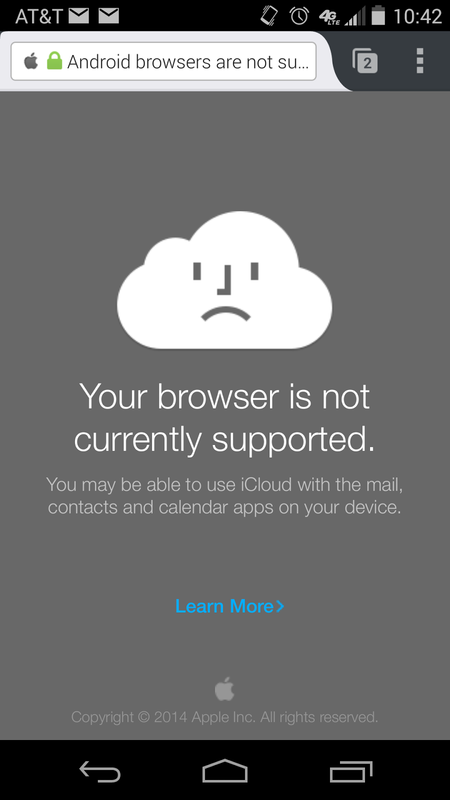 The screenshot also says that I may be able to use iCloud with my phones mail, calendar, and contacts. They know that I'm trying to access a photo album. How is what they're suggesting as a possible fix applicable to my situation? Providing your customers (or potential customers) a great experience means being helpful when things don't go as they expect. It's not enough to make the experience work as you expect, you need to make the experience work as THEY expect. Thanks for pointing out the finer details of what technology customer support should entail. One error message that is a helpful example is the Chrome mobile no web connection message. A little dinosaur and the message "You are not connected to the internet." is far more helpful in reminding me to turn on the data for my phone.